Osmotic – Osmotic as in “osmosis”. In osmotic Diarrhoea something is causing water to be drawn into the bowels. This is the kind of Diarrhoea that many people experience when sucking on sugar free candies or chewing gum that contains the sugar substitute Sorbitol. The Sorbitol instead of being absorbed by the body like sugar, remains in the bowel and draws water into it. Secretory – Secretory Diarrhoea is when the body itself “secretes” water into the bowel in a greater than normal volume resulting in Diarrhoea. Many things including drugs, allergic reactions, and infection can cause secretory Diarrhoea. Exudative - Exudative Diarrhoea is when blood or pus in the stool also accompanies the loose bowel movements. Exudative Diarrhoea is obviously of more concern than the others are. It is usually the sign of a serious disease such as Crohn’s disease, ulcerative colitis, or a severe bacterial infection. Diarrhoea can also be associated with irritable bowel syndrome. Except in extreme cases such as with food poisoning or other grave bacterial infections, or parasitic infestations Diarrhoea is rarely life threatening. The biggest danger with Diarrhoea is dehydration. Most mild cases of Diarrhoea will clear up in a few days on their own, however if needed many effective over the counter treatments are available. It is important to understand that Diarrhoea is not an illness – it is a symptom of something. Diarrhoea should not be treated immediately upon its onset, other then to keep drinking to avoid dehydration. Diarrhoea is part of your bodies defense mechanism, it is a way to get rid of what ever it is that is in your digestive system that is ailing you. More complicated Diarrhoea can be accompanied by other symptoms. These can include abdominal cramps, fever, and vomiting. If you have persistent Diarrhoea with one or more of these other symptoms for more that 24 hours you should seek medical attention. Usually only severe cases, or complicated Diarrhoea that is indicative of another condition such as flu or food poisoning requires medical intervention. Home care can usually help alleviate the worst of it. The main thing with Diarrhoea is to avoid dehydration, so keep drinking a lot of water to replenish the fluids you are losing. Though you stomach may be upset try to eat. It will help. Pediatricians have recommended the “BRAT”(Bandanas, Rice, Applesauce, and Toast) diet for years for children with Diarrhoea and it woks for adults too. Over the counter anti-Diarrhoeal medications like loperamide (Imodium) and bismuth subsalicylate (Pepto Bismol) are effective in most but not all people. If Diarrhoea has been persistent and has caused you to feel faint and dehydrated, hospitalization and intravenous fluids may be required. Oral antibiotics are rarely given for cases of Diarrhoea, even those known to be due to severe bacterial infections such as E. coli. Antibiotics tend to make Diarrhoea worse. There are several natural or non-medicinal way to ease the symptoms of Diarrhoea. Berries, such as blue berries can relive Diarrhoea, but do not eat the seeds they can actually make it worse. 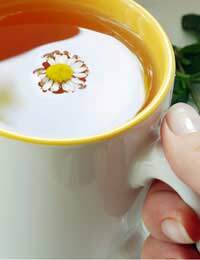 Chamomile tea can help to re-hydrate and sooths cramping of the abdomen. Ginger teas and ginger ale, can also re-hydrate, soothe cramps and relive nausea.